In the 1860s the discovery of gold in the South Island attracted thousands of people. 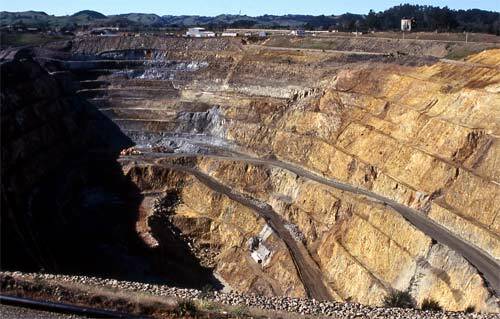 In the 2000s there was still gold being mined in commercial quantities at Macraes Flat in Otago, and here at the Martha mine at the base of the Coromandel Peninsula. Gold was first discovered at Martha Hill in 1878 and the following year underground mining began. It was then mined continuously until 1952, interrupted only by a major strike in 1912. In 1988 the Martha mine was once more officially opened, and opencast mining began, with sophisticated technology to extract both silver and gold from the rock. In 1999, 3 grams of gold and 30 grams of silver were extracted from each tonne of rock.